Tell us a little about yourself. How did you get involved with Ultimate at SEAWEED? Jessica: I’m a senior studying Physical Geography and Geospatial Technologies. I have always played sports and decided to try something new my freshman year. I fell in love with the team and the sport, and haven’t looked back since. Claire: I’m a junior looking to go into nursing. My older sister played in college, and I decided to try it out. I instantly became hooked. What was the highlight of your last season? Jessica: We made it to the College Championships in Madison, WI. We finished 5th overall. The most memorable moment for our team was battling back from a 6 point deficit in semis and a 5 point deficit in the finals at the AC Regionals to clinch the number 1 spot. Claire: UNC is one of our biggest rivals. They are a very talented team which makes for great competition and close games every time we play them. The most memorable game we’ve played against them occurred during ’09 Regionals, when we battled back from a deficit and through universe point to win the region, sending us to the College Championships for the first time since 2001. Tell us about your coaches. Jessica: Our head coach, Danny Wrenn, is a phenomenal coach and person. He molded a team that, four years ago, didn’t even make it past sectionals into a team that has competed on a national level the past two years. He is very committed and invests a lot of his free time to helping our team grow and become stronger. 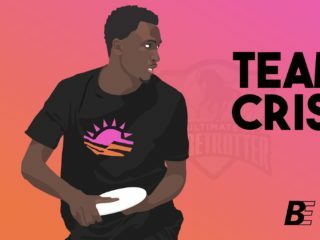 Are there players on your team who deserve consideration for Callahan, All-Region, or Freshman of the Year? What players are most likely to make a huge play as a thrower or as a receiver? Jessica & Claire: Thrower: Claire Chastain, Kelly Tidwell. It’s easy to see when someone throws a huge huck or gets a layout D. Who’s a player you have to watch more carefully to see how valuable she is to your team? Claire: Jessica Patrick is always consistently playing as hard as possible, she’s the most reliable player on the field. How does your team bring new players up to speed? Claire: We usually just throw them into a scrimmage. It’s really hectic at first, but as Danny says, “the only way to learn is to play.” Our rookies have been really quick to adapt. Jessica: Retro vertical stack, and zone defense. Jessica & Claire: Win the College Championships! What has your team been doing to prepare for the spring? Jessica: We had vets playing on competitive club teams, practice 3X a week, going to several tournaments, working with 2nd year players to develop leadership skills. What tournaments do you plan to attend in the spring? Which one are you most looking forward to? Claire: Queen City Tune-Up (Charlotte), Easterns (Wilmington), Centex (Austin), Sectionals, Regionals?, College Championships? We’re looking forward to Centex the most because we have never played in this tournament and we’ve heard it’s really fun. The competition should be at a national level, and we’ll get to see new styles of play from other regions. Jessica & Claire: “Fat Chance by 311” and “Wagonwheel” by Old Crow Medicine Show. 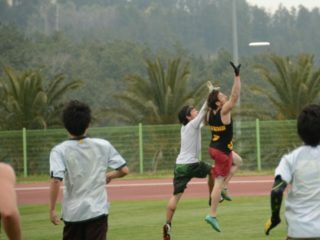 What do you think about the USA Ultimate College restructuring? Claire: Our region gained some teams that make it stronger, which is exciting because it will bring a higher level of competition. 2010 AC Regional Champs, 5th at Nationals, 24-0 in 2011 Preseason. UNC Wilmington Seaweed.